Biggest Market Rally Since 2009 Follows Days Of Painful Losses The Dow had its best day since 2009, gaining nearly 5 percent. But jitters over interest rates, trade tensions and turmoil in Washington have still made December a bruising month in the markets. 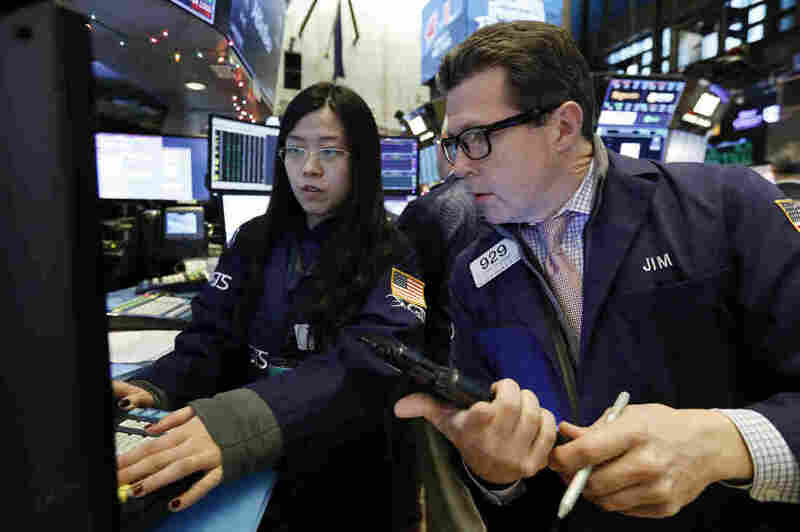 Specialist Vera Liu (left) and trader James Matthews work on the floor of the New York Stock Exchange on Wednesday. U.S. stocks are experiencing a post-Christmas rally after record-breaking losses on Monday. The stock market came roaring back Wednesday with a rally that pushed up the Dow Jones Industrial Average by more than 1,000 points. It is the largest single-day point gain in the history of the Dow. In percentage terms, that's a gain of nearly 5 percent. The S&P 500 was up by a similar amount and the Nasdaq composite index was up even more — 5.8 percent. To be exact, the Dow gained 1086.25 points Wednesday. But even with that gain, it is still down 7.4 percent on the year. The S&P 500's year-to-date loss is a smidgen higher. Until Wednesday, the holiday season had been a big disappointment for investors and traders, with most of the losses coming in the previous four trading days. Markets had reacted negatively to several events coming out of the nation's capital: the partial government shutdown, the resignation of Defense Secretary Jim Mattis and what was widely seen as a bungled response to the market turmoil by Treasury Secretary Steven Mnuchin. After meeting with the CEOs of the six largest U.S. banks, Mnuchin tweeted that banks had "ample liquidity" to meet the needs of borrowers. But instead of being reassured by the comments, markets continued to tumble. When asked Tuesday if he had confidence in Mnuchin, President Trump said he did: "Very talented, very smart person." On Wednesday, White House economic adviser Kevin Hassett said that Trump was happy with Mnuchin's performance and told an NBC reporter that Federal Reserve Chair Jerome Powell's job is "100 percent" safe. The comments appeared to work together to play an important role in a "relief rally" of epic proportions. But concerns about a slowing global economy and the protracted trade dispute with China have not gone away, and they are likely to put pressure on the market again in coming days. The final week of 2018 trading didn't get off to a good start. On Monday, the Dow logged a nearly 3 percent loss — breaking a 100-year-old record for the worst showing on Christmas Eve. Stock markets in Asia were mixed on Wednesday. Tokyo's Nikkei 225 index was up less than 1 percent, while markets in Shanghai and Hong Kong were down less than half a percent. European markets were also mixed, with Frankfurt's DAX showing a small gain, while the FTSE 100 (London) and the CAC 40 (Paris) moved lower. If Wednesday's gains do not hold and slip away in the next three trading days, U.S. stocks could still have their worst December ever. The words "bear market" have recently been on the lips of more than a few traders and analysts. A bear market is a drop of 20 percent from a peak. At the start of Wednesday's trading, all the major indexes were in or close to a bear market. But the rally provided some relief. And for now, the bear is in hibernation. As for a Santa Claus rally, at least one market observer is trying to manage his expectations. "Year-end trading can be slow, as window-dressing can easily take over trades," Howard Silverblatt of S&P Dow Jones Indices told The Washington Post. "At this point the best gift Saint Nick can give us is a stable market. Gains would be a nice extra, but less volatility would help support confidence in the market, and permit longer-term investment decisions — by investors and corporate planners."